Free radicals are a normal byproduct of the metabolic process, but they can interfere with otherwise healthy body systems. For example, an excess of free radicals can wreak havoc on our immune systems. Our bodies naturally create and utilize antioxidants from the foods we eat to fight off these free radicals, but we could do better! 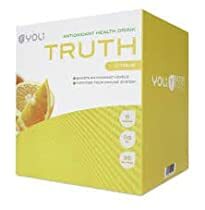 You can increase your antioxidant levels and benefit from a stronger immune system with TruthTM. This delicious citrus health drink contains BotanImmuneTM, an exclusive combination of superfruits, and ActiZorbTM, a proprietary blend of minerals and enzymes. With powerhouse ingredients like pomegranate, açai, resveratrol, and stevia, Truth will keep your immune system strong.